Discovering The Small Miracle Of The Soup Dumpling : The Salt Soup dumplings are a miracle of transubstantiation, and the reciprocal of every other dumpling you've had. If they're made right, the dough will release the broth and fade away as you snap through the meaty filling. A xiao long bao, or soup dumpling, in a large spoon. The first I ever heard of soup dumplings was 15 years ago in this New York Times story, which described xiao long bao as "the star of the show" at Joe's Shanghai in New York's Chinatown. It was a different era of New York food, when Szechuan peppercorns were still contraband, and the selection of Chinese restaurants was less diverse. When I arrived at Joe's Shanghai, I entered a narrow storefront on a narrow street. Inside, the tables were all large, seating 8 or 10. Since it was mid-afternoon, I had one of the large tables to myself, which assuaged my loneliness — I was a teenager and knew next to no one in New York — by heightening it. At Joe's, there are two kinds of soup dumplings: pork, and pork and crab. I asked for one order of each, expecting some manner of soup to arrive, soup that The New York Times had promised me was rich and sweet unlike any other. Let me state my prejudice clearly: Soup is the best food. It is elemental in a way no salad or sandwich can aspire to. A well-made broth contains within it the continuation of the past and glimpses of the future. The liquid coats your tongue and the interior of your cheeks, hot enough to imply, and even incur, injury. Each spoonful implies the next as logical and inevitable necessity. But instead of soup, the waiter placed on the table in front of me two stacked bamboo steamers, each the diameter of a large plate. He lifted the woven lid off the steamers, revealing decidedly solid-looking dumplings, and then demonstrated the protocol to me, lifting a dumpling with chopsticks from the steamer and placing it in one of the broad, flat-bottomed spoons standard in Chinese restaurants. But he stopped the demonstration there. After he departed, I lifted the spoon to my mouth and took an eager bite. But dribbling over my chin, burning my lips and my tongue, was, as promised, soup. Soup I'd carelessly unleashed in a small flood. I treated my second dumpling right. It isn't hard to execute the proper procedure, once you understand that these dumplings are a miracle of transubstantiation, that the translucent skin is filled with liquid, that these indeed are the paradoxical reciprocal of every other dumpling you've had. I'd attacked the first dumpling like the overeager teenager that I was, as if trying to kiss a girl by awkwardly sticking out my tongue. 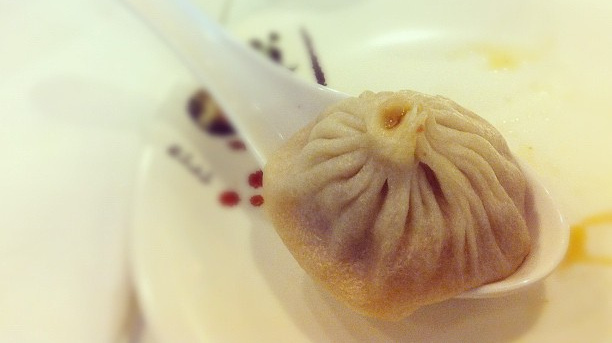 To skillfully eat a soup dumpling, you must nibble a small hole in the dumpling's edge. If it was made properly — and many aren't— the dough will be sufficiently supple to withstand the rigors of transfer from the bamboo steamer to your large spoon. When you bite, it will give, but only just. A well-made dumpling has dough that is strong, flexible and not very thick. 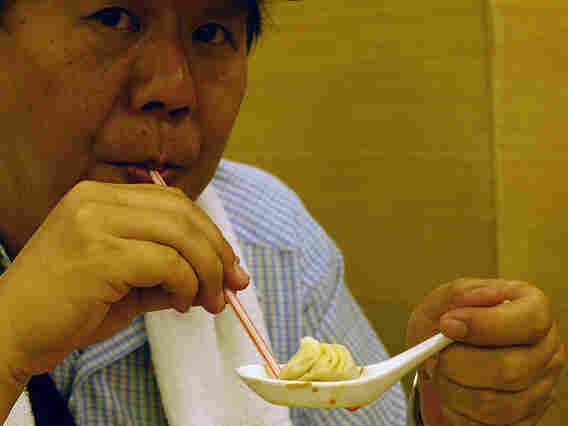 Looks like a good way to eat a soup dumpling, but it's only a straw man. The dough will release the broth, and just when you feel as if you'll melt from the deliciousness of it, you open your mouth again, like a hungry, hungry hippo. Having been softened by the broth, mellowed by its harmony, you can decisively snap through the contrast of the meaty filling, which has a reassuring substance, like a handhold after a long swim. The wrapper, having fulfilled its purpose, fades into the broth it once contained. The dumpling's inversion is now complete. The thinness of the wrapper is essential: If it's too thick, the doughy note will dominate, bringing the whole experience from sublime to everyday. I've never had them in Shanghai itself, where they are said to have originated a century ago, in the northern part of the city. So I can't speak to the authenticity of Joe's Shanghai's formulation, though I can't imagine any dumpling more genuine than the first ones I'd tried. I've returned many times and Joe's hasn't always been consistent. Sometimes the broth, filling or wrapper is off just a bit, with dissonant and disappointing result. But I've kept going back. A few months ago, I met some friends I hadn't seen for years at a branch of Joe's in midtown Manhattan, part of the restaurant's expanding empire. There were 15 of us or so, and they gave us a whole room to ourselves. Their toddlers ran around, as a few of us sat fixed at table. We ordered a large tower of dumplings, and went through it quickly. Some maintained clean plates, having deftly sucked all the broth from each dumpling. Others, less dextrous, slowly covered their plates with escaped broth. When liquid threatened to spill over the edges, we brought the shallow plates to our lips and drank the surplus, cooled broth. As the children cried around us, we ordered more dumplings, and then more, confusing the waitstaff in our gluttony. They thought we could not possibly have wanted the number of dumplings we ordered, that we must have inadvertedly duplicated our requests. But we wanted these dumplings, and many more. Each was as good as that second one I'd had in adolescence, as if the dough held the years since, dissolved in soup. Konstantin Kakaes is a fellow at the New America Foundation and author of the e-book The Pioneer Detectives.